We pray you are well and in strength of īmān, may Allāh preserve you upon the Sunnah. Salaatul-Eed will be prayed in Small Heath Park, Coventry Road, Birmingham, B10. Inshaa’Allaah, at 7am. (Eed day to be announced on Sunday 27th July, inshaa’Allaah). Attending the Eid prayer is obligatory upon every Muslim, male and female. Even the menstruating women should attend but withhold from the prayer. This is the longest running outdoor Eid Jamaa’ah in Birmingham, alhamdulillaah. 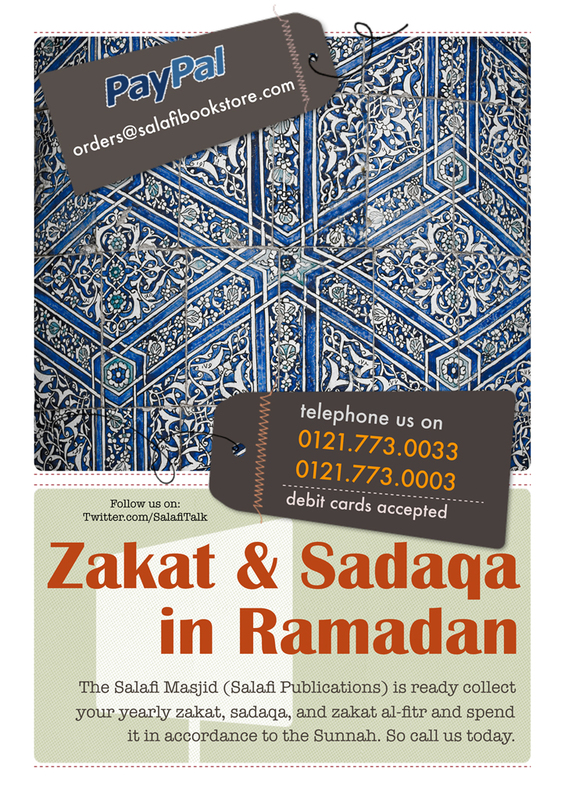 We are collecting Zakaatul-Fitr on your behalf until Sunday 27th July 2014 / 29th Ramadaan (deadline 3pm BST) – £1.50 per person. Ibn Umar (radiyallaahu ‘anhumaa) stated that Allaah’s Messenger (salallaahu ‘alaihi wassallam) ordered that Zakaatul-Fitr be paid by every Muslim, free and slave, male and female, young and old. The Fitr is to be given to the poor as food, and this is what we will do with your payment, inshaa’Allaah. Food will be purchased as wheat and distributed amongst the poor and needy, inshaa’Allaah. We also collect your yearly Zakaah at 2.5% of your wealth once the value of your savings have reached the “Nisaab”, which is 92g of gold (approximately £2,100), and they have been in your possession for a year. Zakaat is payable on gold (92g), silver (640g), and on merchandise for sale. We distribute it amongst the needy in the UK and across the world. We spend this in accordance to the Qur’aan and Sunnah. For those brothers and sisters who are not able to fast due to a illness that is not expected to improve, or for a woman who cannot fast due to breastfeeding or pregnancy, then we are also able to distribute your Fidyah (which is feeding a poor person for each day you’ve missed). £2.50 per fasting day (e.g. £2,50 x 30 days= £75.00). Type reference: “Salafi Projects” or “Zakaat” or “Fitr” or “Fidyah”. This is a very easy and convenient way of regularly donating from anywhere in the world. Just click the link “Donate” link on this page. By bank transfer in the UK? • Reference or note: As you prefer. By bank transfer from overseas? • Account Name: Salafi Bookstore & Islamic Centre. • Bank Name: Lloyds Banking Group Plc. • Branch: Erdington, Birmingham, UK. • IBAN: GB14 LOYD 3093 0900 2312 60. • Reference or Note: Salafi Projects. You can pay your Zakaat in any of the ways mentioned above. Assalaamu ‘alaykum! Can we give our zakatul fitr eventhough we live in saudi? One should distribute Zakaatul-Fitr in the land he or she lives.